When most foreign banks were busy cleaning up their books, Bank of America was soaring to greater heights, and eating into competitors' market shares. From being No 3 in the BT-KPMG Best Banks study last year (after Barclays and JP Morgan Chase), Bank of America has emerged as the Best Foreign Bank in India for 2016/17. 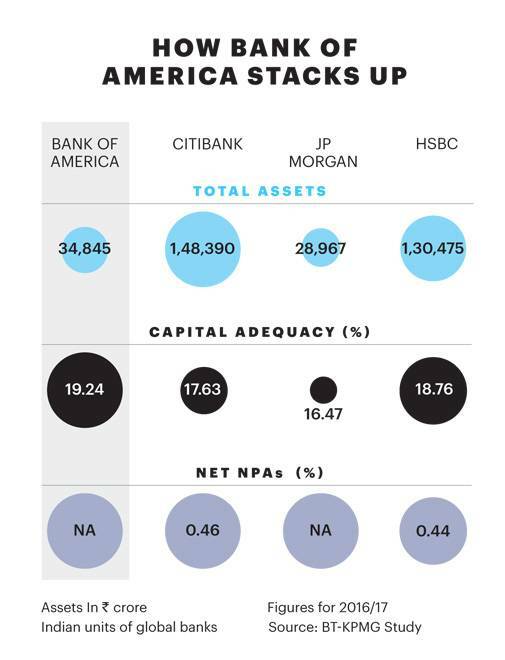 In terms of balance sheet size, Bank of America is at Rs 34,000-crore plus, while the size of its peers Citibank, HSBC and Standard Chartered is over Rs 1,30,000 crore. Some are also broad-based in terms of their product offerings. Kaku Nakhate, President & India Country Head, Bank of America, says consistency has been pivotal for the bank's success. Servicing top Indian corporates and working towards attracting MNCs to India to help them invest or expand have been our focus areas. "We have been consistent in our strategy of partnering key Indian and MNC clients,," she states. The bank has added new clients to its pool of top 200-250 corporates in India. It has also seen a 10 per cent growth in fee income, whereas many other foreign banks saw lower, even negative, growth in 2016/17. In terms of business, the last year was not great for the Indian banking sector because of overleveraged corporates sitting with excess capacity and muted activities on the M&A space. The aftermath of demonetisation and the introduction of Goods & Services Tax (GST) have also slowed down the Indian economy. But, Bank of America thrived. Post the introduction of GST, Nakhate and her team at Bank of America had to hand-hold their clients and "help them through", and that paid off well for the bank. "It was important from a management perspective as it helps in understanding the client better. It's like being a partner," says Nakhate, who believes in building long-term relationships with the clients. "If you show consistency to the clients, they trust you. They also start expecting certain deliverables from your bank." Not being in the MSME space has been the biggest advantage for the bank. "It was a conscious call to not get into the MSME space, and adhere to our strategy of working with top-tier corporates in the country," says Nakhate. If India grows, the 250 large corporates will also grow. That is also the reason for the bank's almost-nil NPAs. In fact, the top 250 clients help the bank cross-sell products. part from being a consistent performer, Bank of America is also the fastest growing foreign bank. It was number one in terms of growth in deposits (47 per cent) and growth in loans and advances (10.6 per cent). Its three-year CAGR in deposit was 33 per cent and growth in loans and advances was 17 per cent. "We have added new products to our portfolio this year, helping us grow our loan book. We may not always be able to compete on loan pricing with domestic banks, but what differentiates us are the global solutions we bring to the table," says Nakhate. She is quick to add that another reason for the bank's growth is its closeness to clients. "You can lend more to the same client as you grow big; unlike a few years back, we are now consistently there with the clients we work with." Its consistency has not just been in acquiring and servicing clients, but also in building a business that is sustainable and continuously profitable. "We have fired on all the four pillars of business. Our two main business streams - global markets and global corporate and investment banking - had an exceptional last year," says Nakhate. While Bank of America is a thought leader in terms of investment banking, the bank has also done well in fixed income. "Our best-in-class fixed income and transaction services business are agnostic to business cycles. Cash management and trade finance are products that clients need irrespective of the business environment," says Nakhate. She believes that although her bank may be a pioneer in the corporate and investment banking business, which is risk-prone, one has to focus on growing other businesses so that the ship sails steadily. Going forward, Nakhate is not averse to looking at MSME companies. "We are looking at the distressed debt market, but it has to match our risk appetite. What I can say is that, as of now, we are looking at it like a hawk." The bank will also "continue to invest in technology and human capital, and better its products and delivery." Nakhate is clear that clients will remain at the centre of Bank of America's growth story. "What differentiates us from competition are our repeat clients."